The Pig Beach family is expanding yet again. The summertime BBQ pop-up got a permanent residency in Gowanus in spring 2016, and now the team branches out further with another pork-named project two blocks south of Washington Square Park. 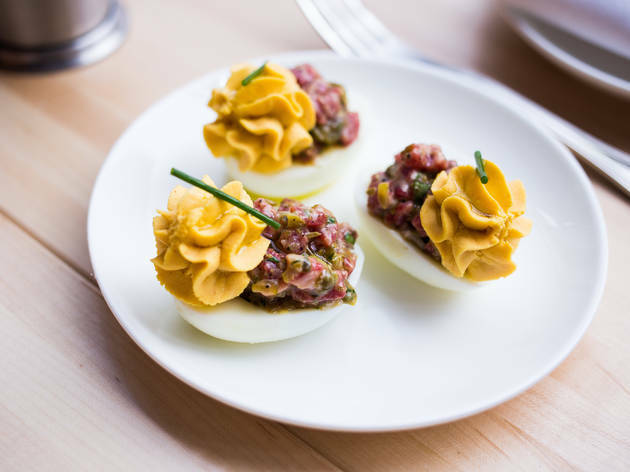 The similarly caloric, if slightly more elevated, menu from Del Posto vet Matt Abdoo is filled with comfort-food twists including deviled steak and eggs, smoked-cod fritters with red-pepper jelly and a crispy confit duck thigh with sweet-and-sour glaze. 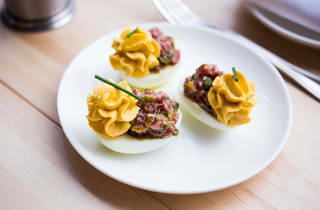 But unlike the scruffy digs typical of ’cue joints, this 56-seat space is bright with 25-foot ceilings, burnt-orange leather banquettes and a brass-accented marble bar.